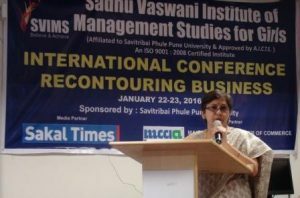 The International Conference organized by SVIMS saw over 150 participants including eminent academicians, senior corporate executives entrepreneurs, journalists, and students. In his opening message to the delegates, Rev. 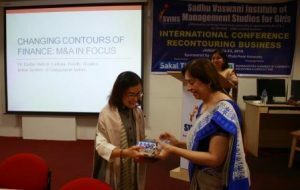 Dada J.P. Vaswani emphasized the idea that recontouring, evolving with context to the times, was not just a matter of survival and overcoming competition; but for individuals and institutions, it is a matter of staying relevant and coping constructively with change. The real challenge of recontouring, he said, is that we change what needs to be changed and preserve what must not be changed. Honesty, Probity in dealings, Integrity and Public Welfare are non negotiable ideals. Dr. B.H. 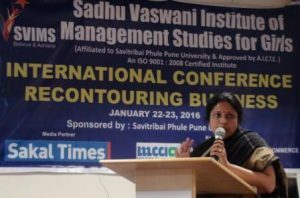 Nanwani, Director, SVIMS, outlined the growth of SVIMS over the last five years and emphasized the team spirit that had made this possible. Touching on the themes of the Conference, she pointed out that tectonic shifts have occurred within the business landscape reflecting changing emphasis from manufacturing to service industry to IT. Recontouring is also happening in terms of a dramatic shift in the balance of global corporate power. There is a change in the very DNA of business impacting its shape, size and way of operation. A new science and craft of engineering, managing and sustaining business is evolving and more emphatically now than ever before. Welcoming the speakers and participants, she invited them to make their interactions and presentations productive and insightful. 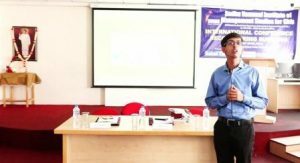 In a well researched and well presented Keynote Address, Mr.Suhas Kelkar, -Chief Technology Officer, BMC Software, Pune, emphasized the idea that the Future is in the Past. 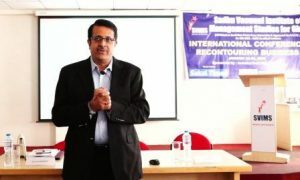 Focussing on technological disruptions, he gave examples of how technical, organizational and behavioural disruptions have recontoured our lives in the last two decades. 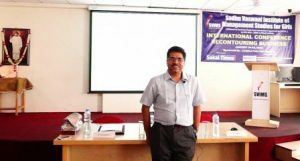 In the Pre-lunch session II, Dr. Subhash Bhatnagar, Faculty IIM Ahmedabad, spoke on ‘Digital India; Opportunities and Challenges in Improving Governance’. He outlined the challenges facing e-governance in India and also the tremendous advantages that the common man and businesses could reap, in terms of saving time and effort and weeding out corruption, if the digital initiatives could be implemented successfully. Addressing the conference participants on ‘Reinventing Sales Force: Winning Digital Fights’ , Mr. Krishna Gopal, Global Talent Head, Tech Mahindra, said that traditional sales methods faced a tremendous challenge from the digital marketplace. Big businesses had to move from their old theatres to emerging new platforms to stay relevant and effective. The post Lunch session featured two distinguished speakers: Dr. Manoj Motiani, Assistant Professor at Indian Institute of Management, Indore and Dr. Rajesh Chandwani, Assistant Professor at Indian Institute of Management, Ahmedabad. Speaking on ‘Recontouring Marketing: neuromarketing and big data analysis in focus’, Dr. Motiani observed that digital footprints and neuro analysis of customer behaviour are changing the dynamics of Marketing today. He pointed out the changing focus of advertising and market research which tries to understand and exploit unconscious behaviour patterns in the consumers’ minds. 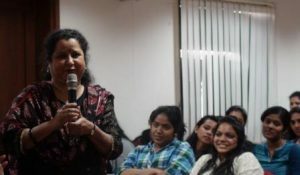 ‘The Missing ‘H’ in HRM’ was the theme of Dr. Chandwani’s talk. Tracing the evolution of the Human Resource Management Functions in organisations over the years, he pointed out that the ‘H” has traditionally been ignored, with employees being treated as machines, unions or knowledge/skills resources. It is only with the rise of the Service Economy that hand and head functions have been superseded by the “h” or the heart. When this is finally appreciated, HRM will become truly humanistic. Digital communication and Web Videoconferencing set the focus for the second day’s session. In a sense, SVIMS recontoured the academic conference format, bridging the gap between continents with technology and making live audience participation exciting. Taking the virtual podium for the Conference on ‘recontouring Business’, at the start of the second day’s session, Professor Aneel Karnani, faculty member of the Strategy group at the Stephen M. Ross School of Business, University of Michigan, US, spoke on ‘Strategic Management and the role of top management’. 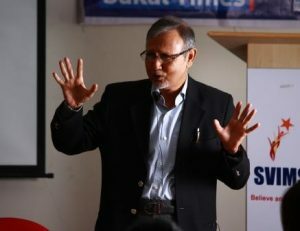 He shattered several myths about strategic decision making and emphasized that trite truths (such as pious statements about high quality products and low prices) that pass in the name of strategy are no longer valid or relevant today. Strategy is about tough decisions; and it involves asking and answering difficult questions. 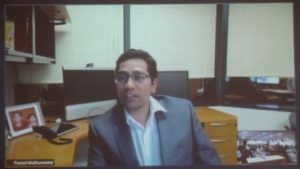 The next virtual session featured a Webinar/Panel Discussion with a galaxy of speakers including Dr.Hemant Purohit – (George Mason University) Mr. Prasad Muthuswamy – (Webex Division, CISCO, California). 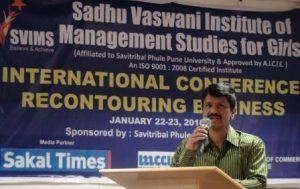 Moderating the discussions from the Pune end were Mr. Kishore Sidhwani, Former VP, Chicago Pneumatic Construction Equipment and Mr. Anil Gupte, Innovator, Entrepreneur, Visiting Faculty & Mentor, SVIMS. Dr. Purohit spoke of recontouring decision making with the help of technology, while Mr. Prasad pointed out that technology is not just disruptive but also transformational. 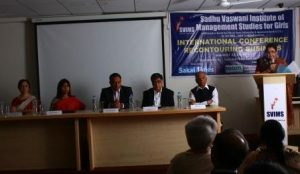 The intercontinental interaction was ably moderated by Mr. Kishor Sidhwani. The session came to a close with Dr. Nanwani’s closing remarks thanking the participants for their participation. 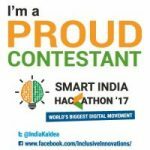 Audience questions to the speakers included everything from Facebook’s Free Basics to KLOUT scores that are now being monitored by recruiters. 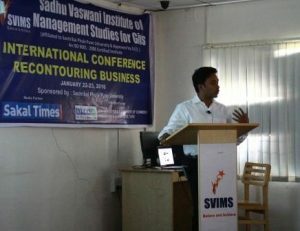 The second day’s pre-lunch session was dedicated to a paper reading and presentation session by participants of the conference. 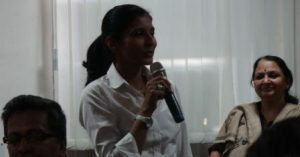 The Session was ably chaired by Dr. G.H. Gidwani and Mr. Anil Gupte. Each research scholar made a brief presentation of his/her research and this was followed by a Q & A Session with the audience. 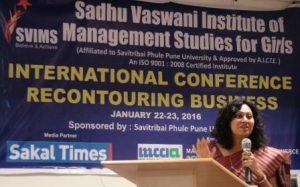 The Post Lunch Session featured a talk by Dr. Radha Ladkani, Assistant Professor at Indian Institute of Management, Indore. 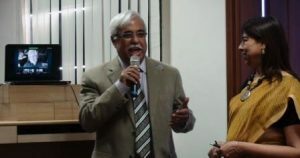 Speaking on “Changing Contours of Finance: M&A in focus’, Dr. Ladkani pointed out that crowdfunding, investor activism and fraudulent practices were reshaping the contours of investments today. 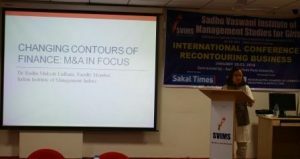 She focused on her core area of research, M & A to draw out the special features of Mergers and Acquisitions in the Indian context. The Valedictory Address was delivered by Mr. Suhas Gopinath, named the world’s youngest ever CEO when he started his own company and presently, founder, CEO and Chairman of Global INC., an IT multinational company. 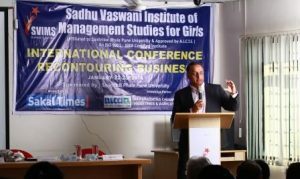 Focussing on the positive impact of Disruptions in Business and Technology, Mr. Gopinath encouraged the students to dream big, start early and focus with passion on their life’s goals. 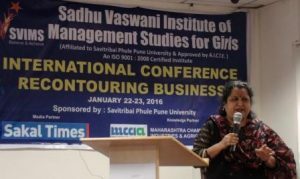 Participants from various city colleges shared their experiences of the conference and expressed their appreciation for the high benchmarks set by the speakers and the excellent arrangements of the same.